Gold, silver prices today: Spot gold was up 0.1 per cent at $1,203.31 in the intraday trade. Gold, silver prices: The precious metal had lost Rs 150 in the previous session on Monday. 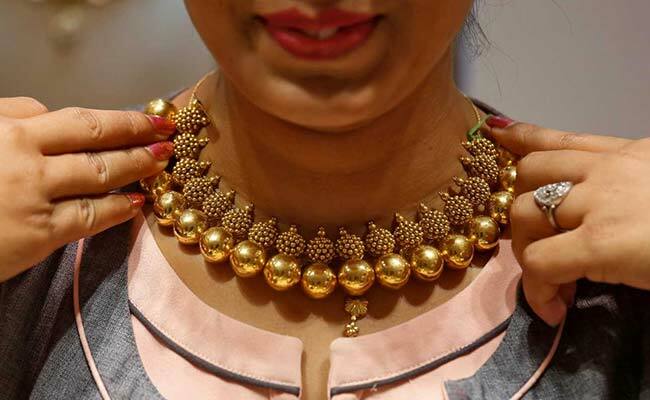 Gold prices surged by Rs 555 to touch Rs 32,030 per 10 grams at the bullion market on Wednesday, taking positive leads from global markets amid fresh buying by local jewellers, reported news agency Press Trust of India (PTI). Silver too went past the Rs 39,000-per kg mark on increased offtake by industrial units and coin makers. Sentiment turned upbeat on positive global cues, as demand picked up after the US and Canada reached an agreement to salvage a North American free trade deal, said traders. Besides, the rupee collapsing to a fresh life-time low of 73.41 against the dollar making imports costlier, too supported the upside in gold prices, they added. 1. Globally, gold rates hit highest in more than a week on Wednesday as the dollar softened and demand for the safe-haven metal got a boost on concerns surrounding Italy's plans to tackle budgetary deficit, reported Reuters. Spot gold was up 0.1 per cent at $1,203.31 in the intraday trade. Earlier in the session, the bullion touched the highest since September 21 at $1208.31. It gained 1.3 per cent on Tuesday in its biggest one-day percentage gain since August 24. 2. In the national capital, gold of 99.9 per cent and 99.5 per cent purity soared by Rs 555 each to Rs 32,030 and Rs 31,880 per 10 grams, respectively. The precious metal had lost Rs 150 in the previous session on Monday. Market remained closed Tuesday on account of Gandhi Jayanti. Sovereign too rose in sympathy by gaining Rs 100 to trade at Rs 24,600 per piece of eight grams. 3. "Gold extends biggest one-day climb in more than five weeks, with some investors forced to close bets on losses as Italy's budget confrontation with the EU (European Union) prompted haven buying. Shorts are being caught out on this one. Weaker near-term stops above $1,200 level are probably contributing to the flow. Traders would focus on US ADP nonfarm employment change for furthest direction," said Jigar Trivedi, Fundamental Research Analyst, Anand Rathi Commodities. 4. In line with overall trend, silver ready gained Rs 450 to Rs 39,400 per kg and weekly-based delivery rose by Rs 460 to Rs 38,980 per kg. 5. Silver coins, however, were unaltered at Rs 73,000 for buying and Rs 74,000 for selling of 100 pieces.